Well, we do all speak English, but UK food terms are a little different. My husband has newly emigrated from England. Our conversations have included many of these confusing terms. 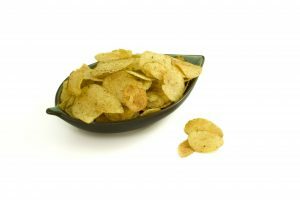 Whichever side of the “pond” you live on, here are some food terms you want to know. They will help you get what you were hoping for when you place that food request. Biscuits and gravy – strictly a US phenomena. 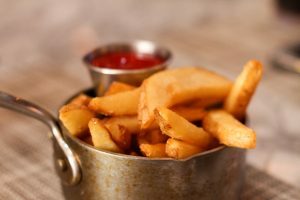 However, they do serve gravy with fries or on potatoes. Mushy peas are not sweet peas. They are a dried marrowfat pea cooked like a dried bean. Pudding is not the American blend of milk, sugar and a thickener. In England, pudding can be sweet or savory. Most commonly, it refers to a desert course, but it can also be part of the main course. Desert puddings are fatty starch or dairy based. They include rice pudding, steamed cake puddings, or with dry fruits added, Christmas pudding. and steak and kidney pudding. 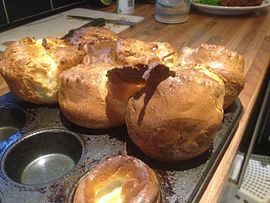 In northern England, the traditional Sunday dinner includes roast, vegetables, potatoes, and Yorkshire pudding. If you are truly craving an American pudding for desert, try this. Ask for a custard (egg-based), blancmange (starch based), or jelly (gelatin base). The names come from the type of base. Breakfast in the UK is traditionally served between 7 – 9 AM. You will find this still common in many hotels, inns or guesthouses. While most British no longer have a “full English breakfast” regularly, you will find it in public lodging. 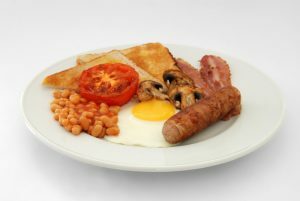 An English or Full English breakfast includes eggs, bacon, sausage, fried bread or toast, baked beans, tomatoes and sauteed mushrooms. Some include black pudding, (meat, fat, and oats). You will also find a selection of cereals and fruit or fruit juices available along with coffee or tea. While I saw breakfast puddings on almost every menu… most guests omitted them. The good news is most hosts are happy to let you pick what you’d like on your plate. It’s a good way to keep control of your diet. Like the traditional American Breakfast, Full English kept a worker fueled up. If you want to maintain your weight on holiday, control your plate. In the US, lunch is traditionally the mid-day meal. Supper or dinner is the evening meal. Dinner is usually a little more formal and sometimes later. But both terms are interchanged. Dinner is generally the largest meal of the day on both sides of the Atlantic. Agricultural workers, commonly had dinner at noon They needed the bigger meal to last the day. Sunday dinner is any time in the afternoon. In the UK the mid-day meal is dinner. Probably historically, this is based on the same reasons as in the US where the term is used. If the dinner (noon) meal was light, people got hungry before a 7:30 evening meal. 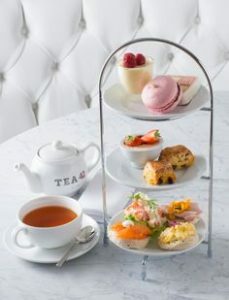 The habit of having a bite to eat along with tea became common and afternoon tea got its name. There are several varieties of tea. If you visit any tea shop or bakery shop in the UK, you can enjoy a cup of tea along with perhaps soup, cakes or other pastries. 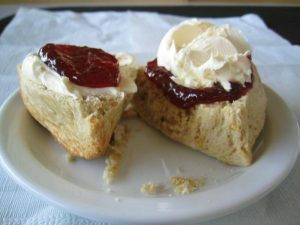 served with a freshly made scone, fresh fruit preserves, and clotted cream. Clotted cream is nothing like the name sounds. No lumps here. Smooth, velvety richness. A cross between butter and ice cream. It uses whole milk like butter. The milk is cooked at a low proofing temperature until the cream sets. Not low calorie, but divine decadence. sandwiches and bite size desserts. Avoid asking for high tea at 2 PM. It labels you as a tourist. Wait until 3 or be safe and check the menu for options. Tea also refers to a lighter earlier evening meal served between 5 – 6:30 PM. In the old days when the workers did not get afternoon breaks, they were starving by the time they got home. So they would have cheese, meat pies, scones and more. They call a later evening meal at home supper. A more formal or dining out evening meal is dinner.